The Heller School’s Executive MBA (EMBA) for Physicians is focused on improving both clinical outcomes and financial results in healthcare organizations by training physician-leaders in the new science of medicine and management. The learning environment integrates the students’ medical expertise with new knowledge in critical areas ranging from health policy and economics to operations, high performance leadership, and healthcare innovation. Learn more about the classroom experience below. The EMBA uses a variety of teaching methods to ensure students remain engaged in the learning and absorb the information. The methods include lectures, case studies, problem sets, simulations, individual reflection, and small group work. For instance, in Dr. Jon Chilingerian’s Leadership and Organizational Behavior course, students practice their leadership skills through a simulation where the goal is to identify support and resistance to a new idea throughout the organizational hierarchy. In Dr. Michael Doonan’s State Health Policy course, students develop and present mock legislative testimony and receive live feedback from their classmates to prepare them to take their expertise back to their own state legislatures. Regardless of the method, faculty look for creative ways to enhance student learning. The EMBA was developed on a foundation of over twenty years teaching dual MD/MBA students and twelve years partnering with healthcare organizations to educate physician executives about the new science of medicine and management. 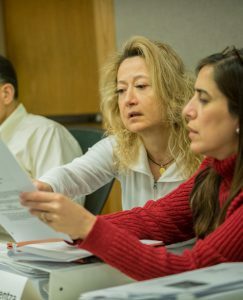 Our faculty are very familiar with the needs of physician learners and are able to go deeper than a typical MBA curriculum to illustrate how the concepts they are teaching apply to the field. Many of the examples and cases used are healthcare focused – even in quantitative courses such as Accounting – so students see a full picture of the intersections between business skills and clinical practice. The faculty also pull from their extensive experience shaping healthcare policy on a state and national level. For example, Dr. Stuart Altman, the Sol C. Chaikin Professor of National Health Policy at the Heller School, serves as chairman of the Health Policy Commission for the Commonwealth of Massachusetts. Every student in the room is a mid-career, practicing physician who brings valuable professional experience to classroom discussions. The Class of 2017 had 800+ years of clinical experience collectively between the 36 students. That background provided examples, best practices, and a common language amongst the students that accelerated the collective comprehension of the material and how to apply it within the industry. Students understand each other and the environments in which they work much more fully than if the program was open to people from other industries, or even to people in other roles within healthcare. That understanding also increases the ability of students to support one another educationally and professionally through the program. The bond built within the cohort and the ability to leverage each other’s professional knowledge have numerous benefits, especially within the classroom. After the residency periods, the courses continue with online sessions. These sessions, also referred to as webinars, are accessed remotely – from home, work, conferences, vacations – but they still resemble a live classroom setting. They are “synchronous”, meaning that the professor and students all join the session at the same time to teach and engage in the material. The software mimics a classroom with live video of all participants, the option for a student to virtually raise their hand to ask or answer questions, and breakout rooms to split the class into groups during the session to work on projects and tackle specific questions. This style differs from typical online courses, which are usually “asynchronous” and lead students through a structured series of modules and quizzes without live professor interaction. The synchronous model tends to work well for people who prefer a traditional classroom setting. It also allows faculty to judge the comprehension of the material by the entire class in a real-time way and allows students to bring their questions and concerns to the whole class at once. You are currently browsing the Executive MBA for Physicians Blog weblog archives for October, 2017.